Ahead of his proposed address to 18 US cities via satellite, scheduled for May 12, Association for India's Development (AID), a US and Canada-based NGO, has asked Gujarat chief minister Narendra Modi to have a closer look at how vulnerable sections of society are suffering in his own state. In a letter to Modi and state revenue minister Anandiben Patel, 54 AID volunteers, who support civil society efforts in India have asked him, in a signed letter, to urgently look into the plight of the salt pan workers in the Little Rann of Kutch. "You must already be aware of the recent untimely and heavy rainfall in the Little Rann of Kutch and surrounding areas", the letter reminds the CM. "Over five inches of heavy rain had turned the desert into a large water body, trapping over 3,200 families, including families in the middle of the Rann", the letter says, adding, "The worst affected from this heavy downpour are the salt-pan workers, i.e. the agariya community, who live and work in the desert for 8-9 months of the year. The makeshift shelters that agariya families had been living in have been destroyed. Up to 80% (~500 tonnes) of their annual salt harvest, some of which was ready to be transported, has been irrecoverably lost. This has resulted in them enduring heavy economic losses". It underlines, "Historically, unseasonal rains have always affected only small patches of land, and the damage borne by the Agariyas has been minimal. However, recently, the biggest losses arose from the irregular release of fresh water from Narmada into the Rann which has affected close to 1,000 families annually in the past. The damages were not only financial but seemingly environmental too as the fresh water might have been affecting the bird nesting sites and the migration routes of other animals in the desert." 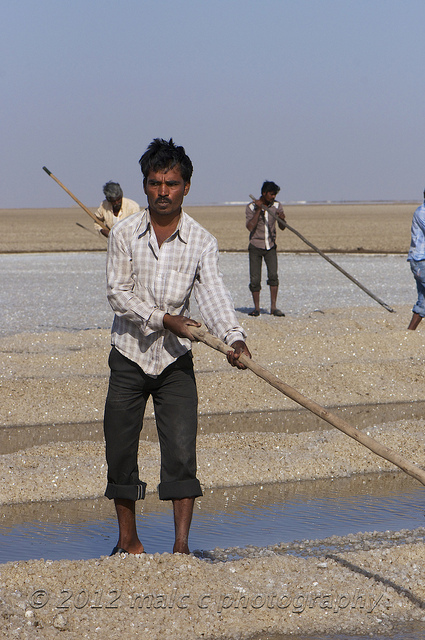 It points out, "Now, due to the recent unseasonal rains, around 3,200 agariya families in Kharagoda and Santalpur, accounting for roughly one third of the population of these traditional salt pan workers in Gujarat, have been affected. The agariyas start every season by signing binding contracts with agents for capital in exchange for prefixed rates for purchase of salt produced at the end of the season. The amount involved ranges from Rs. 1-1.5 lakh. Although the agariyas produce more than 25 per cent of India’s salt, their bargaining power is limited, and they often earn as little as 12-15 paise per kilogram of salt. With their harvest washed away and the lack of any sort of insurance, the Agariyas will plunge into deeper debts this year." Reminding the CM that "the Gujarat government has already taken cognizance of the struggles faced by the community through the establishment of an Empowered Committee for the welfare of the agariyas", the letter informs him that "AID has been involved with the agariya through maternal health, education and empowerment projects", hence, in light of the recent tragedy, it "requests" following urgent actions be taken: * Families who have lost their possessions and income in the rains should be provided with access to zero-interest credit in order to rebuild their lives. Government-issued identification cards can and should be used to make sure that this assistance reaches those who most need it. * Salt production should be insured (as crops are) in order to mitigate such crises in the future. In the long term, the government should facilitate a slow transition from a single crop to multi-crop pattern of salt in close collaboration with premier research institutes such as the Central Salt and Marine Chemicals Research Institute, Bhavnagar. This would minimize losses by reducing the volume of crops to be recovered at the end of the season." * Release of fresh water from Narmada should be done in consultation with the agariya community to ensure that the best scheduling and local geographical wisdom be utilized to benefit everyone.